The DS-U3-S satellites were Soviet scientific satellites launched as part of the Dnepropetrovsk Sputnik program. They were used to conduct multispectral imaging of the Sun. These satellites provided data on the hottest areas of the solar corona in X-ray and ultra-violet spectral regions and were used to assess the quantity of short-wave solar radiation absorbed by Earth's atmosphere. These satellites were all launched on Kosmos-2 boosters from Kapustin Yar. Kosmos 166 was the first of these satellites to be launched on 16 June 1967. It was launched into an orbit with a perigee of 277 km, an apogee of 534 km, an inclination of 48.4°. It operated until 26 September 1967. On 25 October 1967 it decayed from orbit and reentered the atmosphere. The second satellit was Kosmos 203, launched on 5 July 1968. It was operated in an orbit with a perigee of 278 km, an apogee of 518 km and an inclination of 48.4°. 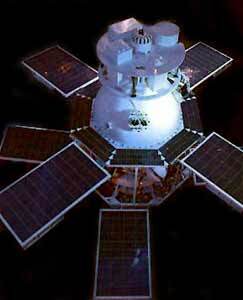 It remained operational until on 2 November 1968 it decayed from orbit and reentered the atmosphere.